On your left, 1950s housewife high fashion. On your right, 1990s grunge. I don’t mean to be stereotypical, and I have no idea why this is, but a lot of things that come out of Japan often turn out to be fashion gold. Such is the case with manga artist Ai Yazawa’s portfolio of works, including her 1992-1995 hit, Tenshi Nanka Ja Nai (I’m Not An Angel). Need a refresher on your Japanese terminology? Manga stands for Japanese comics, often the original artistic vehicles for familiar anime hit series such as Dragonball Z, Sailor Moon, and Akira (yeah, remember those? …No?). Illustrated storytelling has a long and deep history in Japan, and unlike how it is in some countries, manga is enjoyed by all kinds of people in Japan, like the average office lady, old people, and little brats in grade school. That’s why popular manga artists enjoy great influence and can play major roles in affecting public opinion, directing cultural paradigms, or in this case, setting trends – fashion trends. Ai Yazawa, born in 1967, began publishing her works in the eighties. 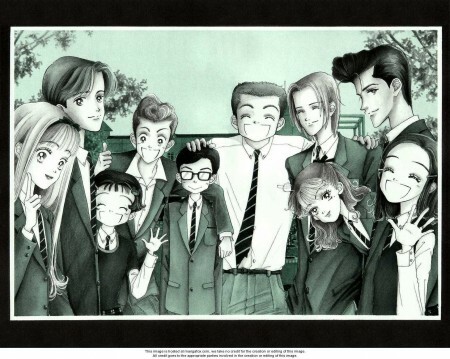 A fashion school drop-out, Yazawa’s works always depict characters with distinct tastes in style. In the West, Yazawa is more known for her edgier later works such as Paradise Kiss and NANA. In comparison, Tenshi Nanka Ja Nai can be described as a high school romance story about Friendship! Love! and Teenage Angst! High schoolers are super gorgeous in manga, as they are in movies, sitcoms, video games, and music videos. Not so much in real life. Sob! Don’t underestimate the fashionable potential of these young drama queens! 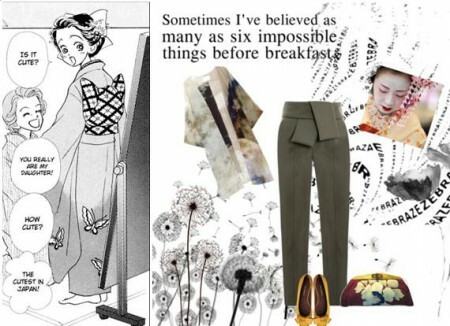 Some of the most memorable scenes in the entire manga are all about fashion. This is the face you make when you make a true fashion discovery. Whadda fashionista. Here, we see our cute little protagonista walking to school in casual clothes. She finishes her short journey and looks down to see that she’s come to school in wooden clogs (which are, presumably, not allowed in Japanese high schools)! Ah well – Midori now knows the reason behind the delightful sound of her walk and simply smiles. This scene reminds me of some fantastic wooden-soled shoes found by our Ricepaper editor, Ray. 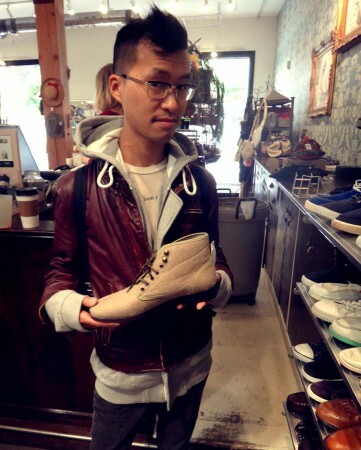 These shoes were found at the lovely Front & Co. – vintage clothing store and hipster hangout. Before I stepped into this place, I thought consignment boutique meant Value Village. The point of focus in this scene is the sound effects: “CLOP CLOP CLOP CLOP!” As our lovely protagonist Midori makes sure to point out, the charming thing about wooden-soled shoes lies precisely in their happyful walking sound. Look at our cast of good-looking high school characters navigate the teenage jungle. Safari style never gets old! 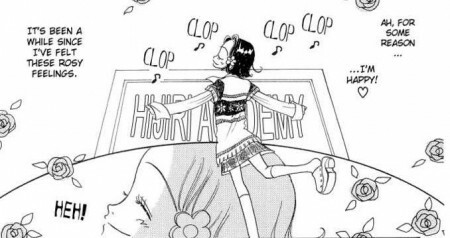 This sephia shot is from the coverpage of The Chapter in Which Mamirin Goes Missing. Who the hell is Mamirin and why should you care? Mamirin is the attractive blonde but studious friend of our heroine, Midori. She goes missing because in the previous chapter, the ex-girlfriend of her super secret crush comes to their school as a new student! 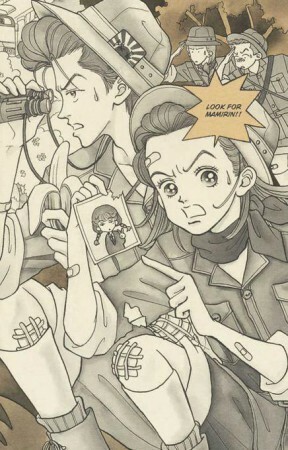 This is, of course, enough excuse for Ai Yazawa to draw a full-page spread of the characters in safari gear – beat-up, tattered, but still fashionable in their search for Mamirin. 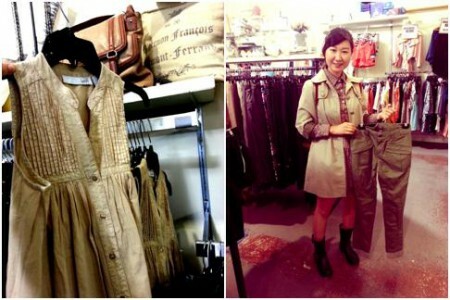 Another stroll around Front & Co. revealed plenty of selections to outfit you for your own conquests this season. On the left we have a cute shirtdress in the ever-lovely ecru tone. On the right, I’m holding up a dependable pair of olive-green cargoes (dependable, of course, in the case of a fashion emergency). Dang. Are you really an Asian motha, lady? Because my Asian motha would have been excruciatingly objective if I asked her a question like that. Put on a kimonospired outfit this fall and you too can become the cutest in Japan. Always dress true to yourself!